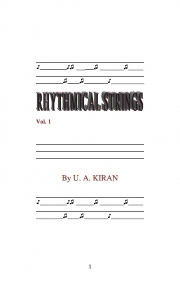 Description of "RHYTHMICAL STRINGS (eBook)"
‘Rhythmical Strings’ is a collection of poems and a Poetic Drama. U. A. Kiran, born in Kerala, educated in West Bengal employed in Andhra Pradesh, is now in Goa. He is interested in creativity like writing poems, stories, drawing, novelettes/novels, dialogues/dramas, chalk-shaping, etc..
His Books: The Alpha and The Omega and Other Stories, Lost Smiles, Beginner's English Grammar. Reviews of "RHYTHMICAL STRINGS (eBook)"